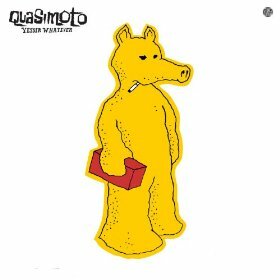 For those of you who have been living above the underground hip-hop scene for the past decade, let me take a moment to give you the skinny on Quasimoto. Quasimoto is one of the many alter egos of LA-based rapper, producer, bandleader, multi-instrumentalist, cartoonist and all-around hip hop legend Madlib. With a career now spanning two decades, Madlib can be credited with pioneering a unique style of hip hop that cuts across audiences and genres. In the late 1990’s, Madlib, unhappy with the Barry White-ness of his voice, decided to slow down his self-created instrumental tracks, rap slowly, then accelerate the whole track up to normal speed. Out of a cloud of pot smoke and seemingly barbaric recording techniques, came Quasimoto’s recognizable, high-pitched voice. Tracks often feature other rappers such as MF DOOM, M.E.D and more commonly, Madlib, whose voice inter-changes with Quasimoto’s. If Quasimoto’s style is cubism, then Madlib’s instrumentals are expressionism; samples within Quasimoto tracks can be traced to everything from Herbie Hancock to Neil Diamond, to excerpted dialogue from 1960’s exploitation films. Without a doubt, Madlib can be considered one of the most cultured, innovative figures in hip-hop.